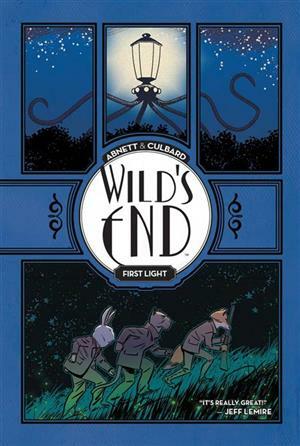 I don’t even remember where I heard about Wild’s End, but the point is I did and now I have to talk about it. Wild’s End is a 12 part series about a village inhabited by talking animals in the English countryside during the 1930’s. Things start to go horribly wrong for the quaint community when it falls victim to an alien invasion. The story follows Clive, Peter, and Gilbert as they try to survive and escape to warn the world. The series is brought to us by Boom! Studios and is written by the incredibly talented, Dan Abnett, with amazing artwork by I.N.J. Culbard. It can now be picked up in two volumes which each contain 6 of the 12 issues, plus bonus material. The two volumes have very distinct feelings. Each one tackles a different theme while looking at the concept of an alien invasion and the reactions to such an event. The pacing throughout is fantastic. I loved the tense build up leading up to the reveal of the aliens who aren’t ever truly shown, but instead reside within large, mechanical vehicles that are as terrifying as they are non-descriptive. If all this is sounding somewhat familiar, that’s probably because it is. If you’re a fan of science-fiction then I’m sure you are familiar with the classic piece of work, The War of the Worlds, by H.G. Wells. This story is basically a clever re-telling of that incredible book, paying homage to it whilst still providing some fresh new ideas that are injected seamlessly into the narrative. The one major difference is that all of the characters are talking animals. What I like about this is that these aren’t just any talking animals like in Zootopia, or Madagascar. These are all very British animals; a fox, pig, cat, and bull mastif all feature in the roster. It looks and feels very British and much like War of the Worlds, it reads like a British story. This is basically the love child of War of the Worlds and Sylvanian Families and I utterly adore it. As I mentioned earlier, the story, for me, comes in two distinct parts. The first half focuses on the discovery and horror of an alien invasion on the people affected directly. Our characters, who up to this point have lived a life in the peaceful, English countryside (most of them at least) now find it difficult to come to terms with what is going on. It’s these characters that really make this graphic novel excel. I love the three main characters. Each offers a very different perspective to what is going on around them. There is plenty of snappy dialogue between them which made me think of Edgar Wright’s, Simon Pegg’s, and Nick Frost’s Three Flavours Cornetto Trilogy; another staple of British popular culture. Once the action starts, the pacing changes as the characters frantically try and survive the alien death machines. In true War of the Worlds fashion we don’t really get to see the aliens, instead the focus is on their mechanical vehicles that have lots of long, tentacle-like legs, fire heat rays, and look like old Victorian lamp posts. The aliens pull no punches here and plenty of characters are killed over the course of the story. They are all pretty spectacular and surprisingly gory at times, with Culbard creating some pretty creepy imagery. My favorite being a squirrel character who has half of her face melted off to reveal her skull and now empty eye socket. As we move past the first volume into the second, the story takes a dramatic shift in tone. After weathering the alien onslaught, the survivors now find themselves quarantined by a paranoid military, who are hell bent on covering up the incident and taking charge. The first volume is all about suspense and survival, but the second focuses on government conspiracies and PTSD. What started out as War of the Worlds suddenly takes a left turn to explore the psychological impact of an alien invasion on those involved. The story strides headlong into X-Files territory here and it’s a nice change of pace from the first volume. What I really liked about the volumes, apart from the incredible production quality, was the bonus content found between the issues (chapters) of the story. These took the forms of journal entries, transcripts, and newspaper articles to name a few. They were all enjoyable to read and they really helped to flesh out the world. Speaking of the world, I really appreciated the 1930’s setting and especially how everyone talked. It was easy to tell at a glance who was local to the countryside, and who was an outsider. The well educated spoke differently to the farmers and it was through clever use of English slang (which I enjoyed a lot) that these kind of character differences were clear. The way a character speaks says a lot about them and in this, Abnett was able to really diversify the characters. I enjoyed the introduction and portrayal of the military in the second volume, and how they would typically try and deal with a situation like this. It felt very authentic for me and I liked the conflict between the morally disciplined military leader, and the shady government agent who are both trying to achieve the same results, but in very different ways. I don’t want to give too much away here, but there are some very interesting conversations during this part of the story. All of the tension and slower pace builds towards a really interesting, if not bleak ending that wrapped things up nicely and left me satisfied. It’s a very isolated story which I think plays to its strengths as you get to experience a situation, which is normally discussed at a high level, by the people on the ground. 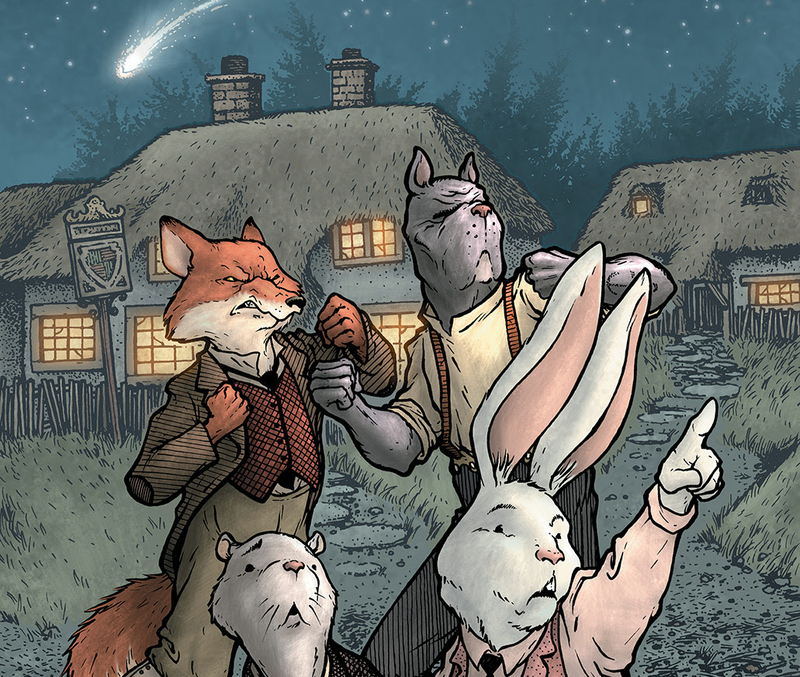 Wild’s End is a charming story and a great example of good character driven science-fiction. The art is fantastic and there are some truly incredible panels here that will stay with me. This is absolutely worth your time and money, and I think if the legendary H.G. Wells was around today he would really enjoy giving this a read too. Wonderful story, reckoned we could combine a number of unrelated information, nonetheless actually really worth taking a search, whoa did one particular study about Mid East has got far more problerms at the same time.